The Memorial of the Deportees pays homage to all deported persons from the department of Mayenne, sent to concentration or extermination camps during the Second World War. This unique site in the whole western part of France centres around two complementary spaces : that of memory and of vigilance. 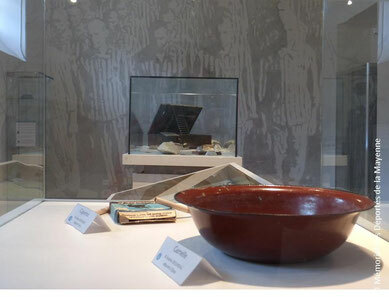 Objects brought back from the nazi camps, exhibitions, timelines, walls with names, written and oral testimonies of the deportees, are presented in a special atmosphere and adapted for everybody. More than a place of memory and reverence, the Memorial is a place of sharing, of artistic expression, of information and watchfullness. Inaugurated in 2012, this Memorial seeks to act as the conveyor of memory and to awaken conscience in the face of current events. 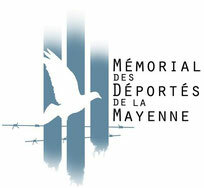 The Memorial is run by the association for the Memorial of Deportes, recognized of general interest since 2012. You can support this association and the Memorial with a donation or and in joining. You can visit the Memorial by yourself. Leaflets for visit/ in English/ in German/ are available at the office. ; you, also, can follow a guided visit at 2 pm and 4 pm. To have a guided visit in English or in German, thanks to contact us beforehand ( by email « memorial.deportes53@gmail.com »). From Tuesday to Saturday and on the first Sunday of each month from 2 pm to 6 pm. Closed on bank holidays (jan 1, may 1, may 8, jul 14, aug 15, nov 1, nov 11, dec 25) and during christmas holidays and in january. Visit in autonomy 5 euros ; per adult. 3 euros for job seekers and students. Free for least than 12 years old. 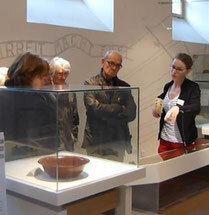 Guided visit 6 euros. 4 euros for students and jobseekers. at 30 minutes from Laval, 25 minutes from exit 4 on the A81 (Le Mans Rennes). 1 hour from Alençon and 3 hours from Paris. on RN 12. 250 metres on left after bridge Mac Racken (towards Rennes). Situated between the tourist office and city hall (mairie). Stay on parking rue Charles de Gaulle or on the quais (quai de la république) on the river side.